With the exception of a birth certificate, a real estate deed may be the most important document in your possession because it is the only thing that can prove that you own your home. Locating the original deed is also important before purchasing land from someone else. Whether you are curious about the history of a property, proving ownership of your own real estate, or just seeing how many times a title has changed hands, a number of research options are at your disposal. 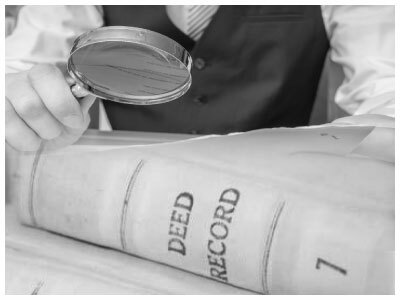 You can use our deed retrieval service to get a digital copy of your real estate deed today. We can pull the most recent transfer document (deed) for most properties within minutes. In addition to deed retrieval, you can also order copies of financial documents and more comprehensive title reports. Almost all real estate deeds are recorded with the local government entity charged with storing public documents where the property is located. This method usually requires a trip to the recorder's office and a nominal fee, usually just a few dollars. Some recorders have property records available online. Check with your recorder to find out if this is an option. You can hire a title company or abstractor to go to the recorder's office for you. Prices and turn around times vary for this service. If you used a title company when you purchased the property they may be able to get you a copy for free. Contact them for more information. This information is for getting a copy of a previously executed deed. If you are looking for a blank real estate deed form to create a deed click here to visit our real estate deed forms page. Reminder: You are on Deeds.com, we are NOT affiliated with any government agency, we are NOT the recorder's office. THE SERVICES ARE INFORMATIONAL ONLY AND ARE NOT INTENDED TO PROVIDE SPECIFIC COMMERCIAL, FINANCIAL OR INVESTMENT ADVICE. THE SERVICES ARE BASED UPON CERTAIN DATA AND/OR RECORDINGS, SUBJECT TO FREQUENT CHANGE. DEEDS.COM MAKES NO WARRANTIES OR REPRESENTATIONS ABOUT THE METHODOLOGIES USED OR THE ACCURACY, TIMELINESS, RELIABILITY OR COMPLETENESS OF ANY OF THE SERVICES. THE SERVICES ARE PROVIDED ON AN "AS IS" BASIS, WITHOUT WARRANTIES OF ANY KIND WHATSOEVER, INCLUDING ANY IMPLIED OR EXPRESS WARRANTIES OF MERCHANTABILITY, FITNESS FOR A PARTICULAR PURPOSE OR NON-INFRINGEMENT. ANY RELIANCE ON OR USE BY CUSTOMER OF THE SERVICES SHALL BE ENTIRELY AT CUSTOMER'S OWN RISK. DEEDS.COM MAKES NO REPRESENTATIONS OR WARRANTIES ABOUT THE LEGALITY OR PROPRIETY OF THE USE OF THE SERVICES IN ANY JURISDICTION, STATE OR REGION. CUSTOMER SHALL BE SOLELY RESPONSIBLE FOR OBTAINING ANY AND ALL NECESSARY LICENSES, CERTIFICATES, PERMITS, APPROVALS OR OTHER AUTHORIZATIONS REQUIRED BY FEDERAL, STATE OR LOCAL STATUTE, LAW OR REGULATION APPLICABLE TO CUSTOMER'S USE OF THE SERVICES. THE SERVICES ARE NOT TO BE CONSTRUED AS A SUFFICIENT BASIS FOR UNDERWRITING TITLE INSURANCE POLICIES.